Quilts and comforters are both types of bed covers, though they are used in slightly different ways. However, due to regional difference in dialect, the same item might be called both a quilt and a comforter in different countries. Technically speaking, a quilt is any bed covering that has two or more pieces and insulation between. However, in common use, a quilt is a flat bed cover. The most common type of quilt is a patchwork quilt, where the front or top is made up of many different pieces of fabric. The back is normally different from the front, with a solid color instead of many different patches. Between the two, there is a layer of thin padding. There are also wholecloth quilts, where the front is made of a single sheet of fabric. With these quilts, there will usually be more of an emphasis on decorative stitching than the fabric patterns. Historically, they have been used primarily as bed covers. The fronts of patchwork quilts were typically made from little scraps of fabric left over from other projects, so that they were not wasted. Today, quilts can be used for a variety of purposes. They are still used on beds, but the unique appearance of a patchwork quilt has made it a style of art form. Some quilts will have intricate pictures on the front, a single large picture, or even a series of squares telling a story, such as Harriet Powers’ bible quilt. Aside from their original purpose, they have been used to do everything from educate others to record history and commemorate important events to aid in fundraising and campaigns. They can be placed on beds, but they are also hung up on walls, used in clothing, used as throw rugs, used as tablecloths, used for the sides of tents, and shown off at public events. Comforters are only used as bed coverings. They tend to be much fluffier than quilts, with much more insulation or padding, and the front and back sides tend to be the same. There is some different terminology surrounding the comforter. The word ‘comforter’, as well as the comforters themselves, is only used in American English. While they are not often used outside the Americas, in Australia, the same thing would be called a ‘doona’. In the United Kingdom, British English calls them ‘eiderdowns’, ‘duvets’, ‘continental quilts’, or just ‘quilts’. However, most of these names are used more often for duvets than for comforters. Duvets are slightly different from comforters. The name, ‘duvet’, is French for ‘down’, as down feathers on a bird. This is also why they and comforters are called eiderdowns: they were typically stuffed with the down of the eider duck. 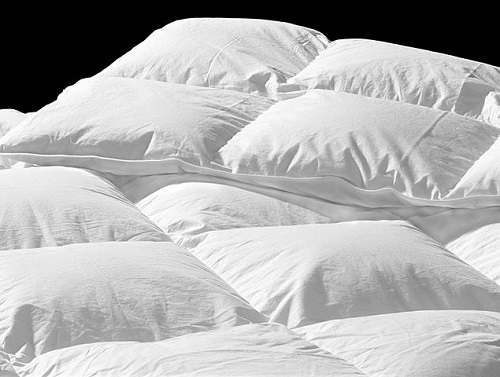 Duvets are usually thicker than comforters. Comforters can have covers to make them last longer, but duvets always have a cover that wraps around them like a pillowcase. Duvets are always as big as the mattress, but comforters are always slightly bigger so that they can hang down over the edges. Finally, comforters are most often used on top of bedsheets, while duvets may be used directly, as their covers make it easier to wash a duvet than a comforter. To summarize, quilts are flat fabrics made of a decorated front, an undecorated back, and a layer of insulation between. Comforters are thicker, not usually decorated, and the two sides are often the same. While quilts have a variety of uses, comforters are only used as bed covers. There are also duvets, which are even thicker than comforters. ‘Comforter’ is a term used only in American English. Quilts, comforters, and duvets may all be called ‘quilts’ in British English, and comforters and Duvets are ‘doonas’ in Australian English. Kianna. "Difference Between Quilt and Comforter." DifferenceBetween.net. April 8, 2016 < http://www.differencebetween.net/object/difference-between-quilt-and-comforter/ >. duvets are very common in the UK. Your comment ‘while they are not often used outside the Americas’ certainly doesn’t apply in Britain. Further afield I’ve never met an hotel chain across Europe that does not use them.